Can LASIK Cause Dry Eyes? It has been shown that LASIK can cause the development of dry eyes and in some instances up to more than fifty percent. In most cases the dry eye syndrome resolves within a few months. The length and severity can vary significantly between patients. What is the Mechanism in which LASIK Causes Dry Eyes? When the corneal tissue is ablated or removed during LASIK surgery, the corneal nerves supplying innervation to the corneal are damaged. This results in a decreased sensitivity of cornea. The decreased sensitivity of the cornea decreases the eyes ability to sense any change in eye lubrication and therefore leads to dry eyes. Over time the nerves regenerate and the corneal sensitivity improves. The symptoms gradually decrease as the eye returns to its previous condition. During the eye exam, the eye surgeon should evaluate the quality of the tear film on the eye using a slit lamp or microscope. Other tests may be used to determine the status of the tear film on the eye as well. Visually inspect the quality of the tear film with a slit lamp examination. 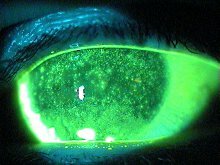 Fluorescein dye is place on the surface of the eye and the patient is told not to blink. The eye doctor then times how long it takes for a break in the tear to develop. Patients with short tear film breakup time have dry eye problems. A Schirmer’s test may be performed depending on the condition of the patient’s tear film. This involves placing a strip of paper inside the lower eyelid and after five minutes measuring how much of the paper became wet with tears. Obviously, people with dry eyes will not wet very much of the paper and this is measured in millimeters. A machine is used to measure the tear osmolarity or saltiness of the tear film. The higher the osmolarity number the dryer the eye. Patients with higher degrees of myopia require more removal of more corneal tissue and therefore more damage to nerve cells in the cornea. Older patients tend to have dryer eyes. Females have a higher incidence of dry eyes. Patients with autoimmune diseases have a much higher incidence of dry eyes. Certain medications such as allergy medicines, blood pressure medicines, and anti-depressants have a side effect of producing dry eyes. The environment that we live or work in can have an effect on dry eyes. Dry air contributes to the symptoms of dry eyes. Patients with dry eyes prior to their LASIK should have their dry eyes treated and under control before considering having LASIK. The use of artificial tears is the first line of treatment of dry eyes. There are different types of artificial tears and you need to try the different ones in order to find out which artificial tear works best for you. This is a drug that is used twice a day and helps the eye produce better tears again. It may also help in the recovery after LASIK as well. Punctal plugs can be used to block the lacrimal drainage system from the eye into the nose. This keeps the tears on the surface of the eye instead of being drained into the nose. Fish may help improve the production of tears in the eye. Dry eyes after LASIK are very common. It is usually mild and resolves within the first few months after surgery. A very small number of patients have persistent dry eyes with pain and blurred vision. Make sure that you know the status of your eyes before having LASIK.